One last time, let's notice God's powerful illustration. Then the Lord said to me, "Go again, love a woman who is loved by a lover and is committing adultery, just like the love of the Lord for the children of Israel, who look to other gods and love the raisin cakes of the pagans." 2 So I bought her for myself for fifteen shekels of silver, and one and one-half homers of barley. 3 And I said to her, "You shall stay with me many days; you shall not play the harlot, nor shall you have a man-so, too, will I be toward you." Q: If Gomer had once again returned to a life of prostitution, would she still be redeemed? 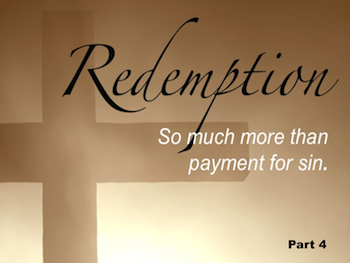 As we established in the last two lessons, full redemption requires more than just a payment, it also requires a proper response. Free-will is essential to full restoration of relationship. It is also essential to the retention of that relationship. 1 John 5:13 is a powerful passage that begs for application in the life of every Christian. In one small verse, John not only summarizes the entire book but also states the certainty of a blessed assurance. "I write these things to you who believe in the name of the Son of God so that you may know that you have eternal life." Not guess, not wonder, not hope, not maybe, the Holy Spirit says Christians can "know" they have eternal life. In the opening verses of this great book, John explains how a person can avoid God's fury and arrive at a confidence of salvation. "This is the message we have heard from him and declare to you: God is light; in him there is no darkness at all. 6 If we claim to have fellowship with him yet walk in the darkness, we lie and do not live by the truth. 7 But if we walk in the light, as he is in the light, we have fellowship with one another, and the blood of Jesus, his Son, purifies us from all sin. 8 If we claim to be without sin, we deceive ourselves and the truth is not in us. 9 If we confess our sins, he is faithful and just and will forgive us our sins and purify us from all unrighteousness. 10 If we claim we have not sinned, we make him out to be a liar and his word has no place in our lives." In this passage, John records three very important principles about walking in the light. If ever there was a lesson that must be taught with conviction, it is this one. Life is a journey, not a single step. Walking in the light is a process, not a point in time. Like physical birth, the point of salvation can certainly be traced to the moment a person leaves the womb of water. (John 3:5, Romans 6:4) But, like any journey, this single step does not constitute a completed process. Faith, growth and unyielding spiritual endurance is also essential. In verse 7, we are told that "...if we walk in the light we have fellowship with one another...." Although the context may be talking about fellowship between Christians, it is important to remember that no fellowship is possible without God and Jesus at its center. In verse 3, John stated this fact when he said, "We proclaim to you what we have seen and heard, so that you also may have fellowship with us. And our fellowship is with the Father and with his Son, Jesus Christ." Many, it seems, believe that attending Christian services makes a person a Christian. This verse clearly shows that all lasting fellowship is first rooted in a relationship with God, not first in a relationship with the church. God saves and then adds to the church. (Acts 2:47) The church does not save and simple identification with a church bearing a biblical name does not constitute salvation. In verse 7, John says that walking in the light means that the blood of Jesus "purifies us from all sin." If walking in the light meant sinlessness, then there would be no sin to purify. In the very next verse he goes on to say, "If we claim to be without sin, we deceive ourselves and the truth is not in us." (1 John 1:8) Obviously, John is not talking about a sinless, perfect walk. He is talking about a journey that is under constant purification in spite of our sin. Does this mean once a person is saved they can never lose that salvation? No, read on. In order for a person to remain on the path of light, there are three things that John says they must do. Notice the immediate context. To remain on the path of light, a Christian must be honest about his sinful nature. "If we claim to be without sin, we deceive ourselves and the truth is not in us." (1 John 1:8) Whenever a person denies the sin he has committed, he strays from the path and the light of God no longer governs his journey. To remain on the path of light, a Christian must make continual application of God's Word in his life. "If we claim we have not sinned, we make him out to be a liar and his word has no place in our lives." (1 John 1:10) When a Christian makes continual application of God's Word in his life, it reveals his sin (point 1) so that he can confess his sin (point 2) and he can continue on the journey of applying God's Word to his life (point 3). Step 3 - He continues on the journey of applying God's Word to his life. (1 John 1:10) That application leads him to the discovery of more sin which returns him to step one. The process is repeated. Staying in the cycle means staying in the light and staying in the light is where the continual cleansing of sin is found. Note: This confidence is only promised to those who are Christians. Have you submitted to God's plan for salvation? Throughout this study, we have learned that retention of redemption is poignantly illustrated through the marital relationship of Hosea and Gomer. God intentionally provided this powerful story in order to make sure that His biblical definition would always be available to mankind. To those who value biblical authority and prioritize Divine inspiration above manmade doctrine, this illustration serves as a standard. Hosea's redemption intention included far more than just ownership, he also wanted Gomer to intend to live with him in faithfulness. His redemption dimension involved two parameters, the payment he provided and the free-will choice she made to live in faithfulness. Lastly, in order for Gomer to have retention of her redemption she had to continue to live in that faithfulness. The message for the church age is no different. We too must exercise a free-will submission to redemption's intention, dimension and responsibilities of retention. The Lord wants to claim much more than just ownership. He wants to restore a full relationship with His creation. Unlike pawns on the Calvinistic chessboard of Heaven, the Bible teaches that humanity is called into a marital relationship with the Creator. He wants a partner not a pawn. Ours is the potential of Divine glory through free-will acceptance of full redemption. The payment has been made. The payment is enough. It's not the payment that is in question. Our response to Christ's offer is the only variable. We must make it real! Purchase your copy of "Questions for Calvin" through Amazon today!